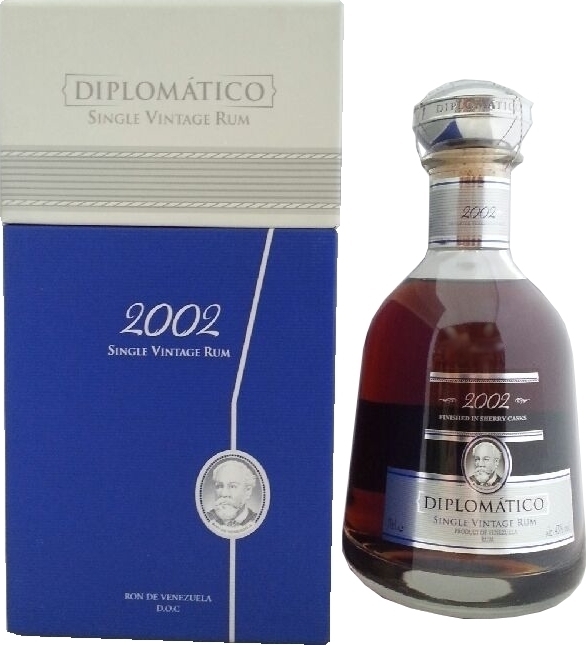 Have you found an online vendor selling Diplomatico 2002 Single Vintage? 43% ABV. Fairly strong nose. Caramel, raspberry, cinnamon/spice, brine. Later, cherries. Oak and vanilla on the palate, with a sherry finish. Oily mouthfeel. Dry at first, then sweet. This 2002 version is smoother than the 2001 version. Climate conditions are certainly the reason . Notes of honey , caramel, vanilla and exotic fruits. Super sweet , very long finish. It is closer to the vintage 2000. Another very good rum from Diplomatico. Needs time in the glass as it gently wakes up. I'm not qualified to discuss this rum properly, I only know I've found a special rum. I poured myself a small sample, made the most of it and now I feel almost nervous pouring myself more. It's as though this drink frowns at you for disturbing it without a valid reason. You're pouring me into that glass for no special reason?? How dare you. Spicy, but sweet finish.It's a bit pricey, but well worth it. And not just the bottle. I'll have to come back and edit this review, but for now I can say it's quite quite good. I might prefer it to the ambassador even. It tastes a little cleaner but you still sense its cask aging. 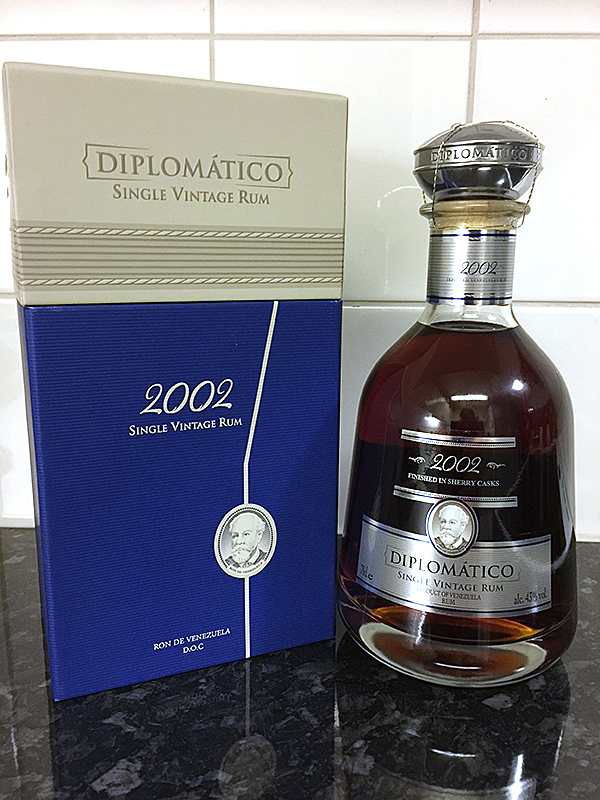 Diplomatico Single Vintage 2002 comes in a very nice package and a beautiful bottle (picture). High class presentation. This rum needs time to breathe in the glass, you get so much more aromas if you let it rest in the glass for about 15 minutes. At first you sense some sticky alcohol but after a while you get smooth sweet aromas of toffee, vanilla and oak. You can also smell a bit of sherry from the barrel. In mouth you get sweet flavours of toffee and vanilla. But you also get some spice and oak. It´s very smooth in the throat with a long aftertaste with sweetness and some spice. A very nice sipper, a personal favourite. I drink it neat. 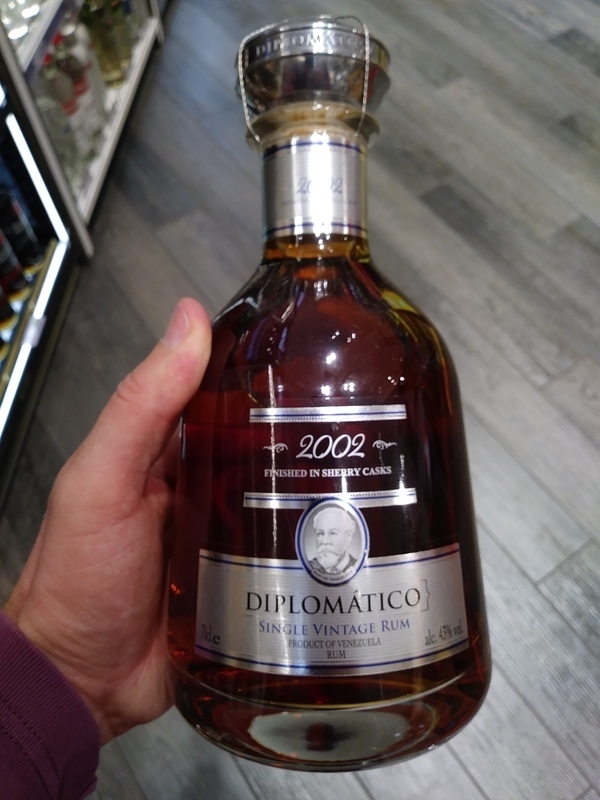 Tried Diplomatico 2002 Single Vintage in Caracas last year and it is an amazingly smooth rum, but the reality is that Reserva Exclusiva is less than half the price and offers you 95% the same experience. In its own right, this is a spectacular rum. Try it out, you won't be disappointed. Single Vintage 2002 has a very nice high end bottle. Toffee, light oak and sherry are clearly identifiable to the nose and palate. This is a must have for any serious rhum collector. Smoothe almost like a cognac on the tongue. Hues of vanilla and honey. A sweet tasting rhum with no burn. I bought what was the last bottle in the store. Havent opened my bottle but bought a taster as well which i thoroughly enjoyed. This rum is not to be drunk as you wud water. 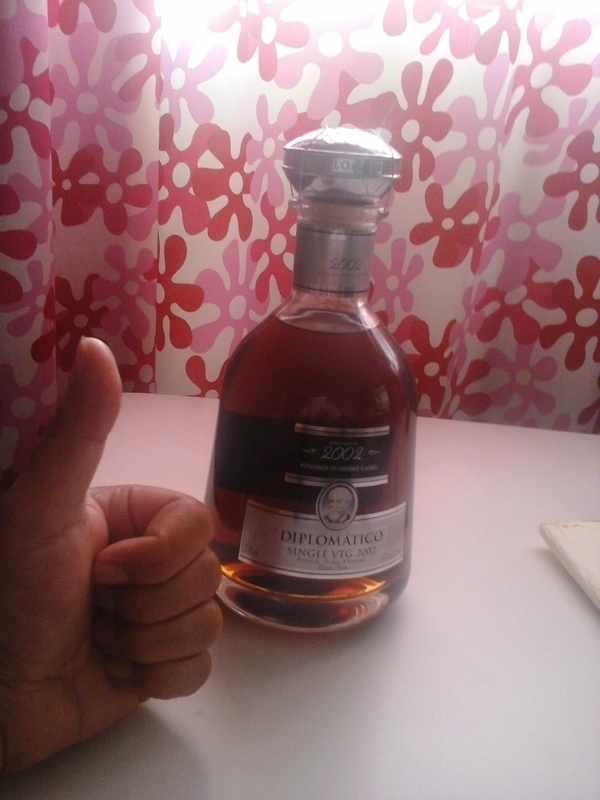 Its a special rhum that should be opened on special occasions. Wonderful. Goes in very smooth, tastes as good as the bottle looks. Feb 2019 in Key West. Finished in sherry casks. Aroma is smooth and complex, with the perfect amount of sherry coming through. Taste is fruity with the sherry coming through, not overly sweet. Not quite as smooth as the one’s above, a slight burn on the finish. My second favorite of the flight, behind Centanario 25. Tasted at the 2018 Chicago Rum Festival. Very smooth and mildly sweet. Some spice and great mouth feel. Second only to the 2000, this is a very smooth rum. It does need some time in the glass, but otherwise it’s amazing! Vzhledem k cene jsem trochu vahal, jestli lahev koupit. Koupil jsem. Nelituji. Skvělý zážitek. Kandované ovoce. Bergamot. Vanilka. Muskatovy orisek. Kremovy zaver. Velmi příjemná, klasická, velmi jemná rumová vůně. Po upití lze cítit medově kořeněnou, jemnou chuť s velkou komplexností a hladkostí. Má poměrně dlouhý dozvuk s jemnou chutí koření a cherry. velmi dobrý, ale nijak mimořádný rum za jistě přemrštěnou cenu. Krásná láhev a balení. Sherry flavor is most apparent, if you pay attention the plumes on the background become apparent in the after taste. Interesting experience, but a bit pricy for that. Nice sweet, complex tastenotes, fantastic scent, and a good long aftertaste, one of my favorites. The tropical fruit is definitely there, along with the toasted oak. Long lasting finish. Taste 8/10. Sweet but not overly, bold taste and heavy-strong-thick with long aftertaste-depth & same time well balance with a little burn in the end, also this is semi-dry (limit for me) & little cognac (i dont like dry & cognac but this has good balance) & for 95 euro i think this is a bit overpriced. In mouth you can feel even cherry, oak-wood, smoke maybe, little sweetness and maybe some more flavours. It was really fantastic meet. What can I say? This vintage 2002 is very smooth, with very long aftertaste. Yes, this one is better than reserva exsclusiva. It’s true about that you need to give a time for it, let him breath. Add good cigar with this Rum! And enjoy moment. Very balanced aroma, body and tail. Full body with decent alcoholic touch. Initially I was surprised by a bit stronger alcoholic smell. Initial burn is followed by intense cocoa taste which persist through the entire experience. There is a bit plainer point and thats why I rate it only 9. I am a fan of the entire Diplomatico line. I believe the 2002 Single VTG could be a 8-9 Rating if priced at $75.00, but at the purchased price of +$120.00 USD, I can’t give more than a 7. Tasting a slight burn across the palette on the front end. On the backend, rich molasses & caramel. 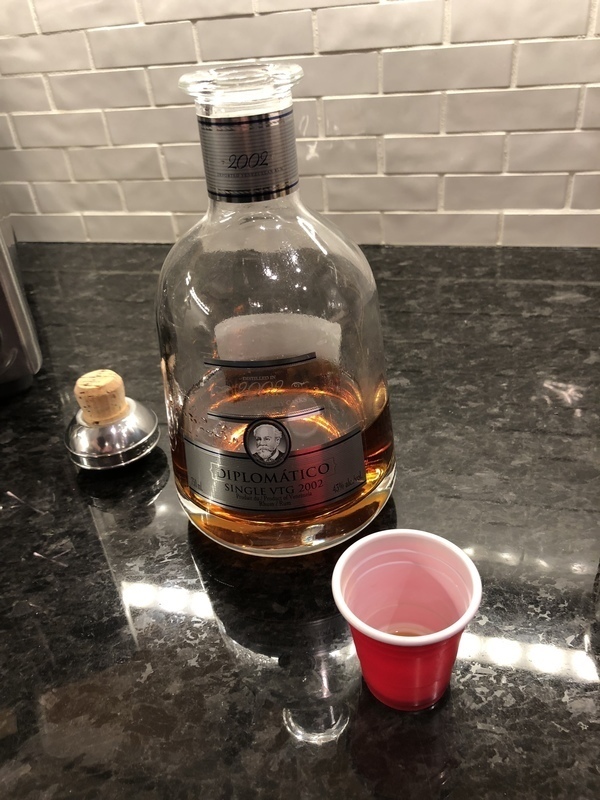 One of the most popular rums in the world is the Diplomatico Reserva Exclusiva, which to me is way to sweet, so I was hesitant to try this Single Vintage Diplomatico. My scepticism was put to shame. Overall: This is a wonderful rum, which brings a lot of flavours to the table and a strong and pleasant aftertaste, which almost lasts for days. It can be recommendede for everyone, who feels like treating themselves.